Christopher P. Canvas at the Defense News offers a piece on the U.S. Navy's 'Fat Leonard' bribery and fraud scandal. 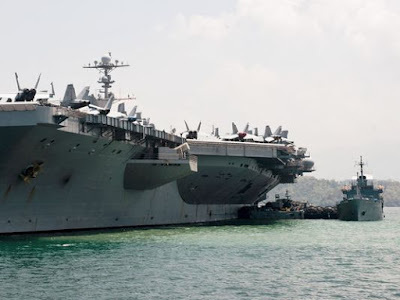 WASHINGTON — The aircraft carrier John C. Stennis swung at anchor in early October 2012 in the harbor at Kota Kinabalu, on the northwest coast of Borneo along the South China Sea. Chinese island-building activities in the nearby Spratly Islands were only just beginning, but the strategic importance of the region was well established. US Navy ships operating with the Seventh Fleet occasionally visited the port, capital of the Malaysian state of Sabah, but this was the first time a warship this large had dropped the hook. It was a major jump, strategically and logistically. But the US Navy needed help in making the port call happen — US planners were not that familiar with the myriad services and arrangements needed to support the Stennis and the more than 5,000 sailors on board. In to fill the void, as throughout the western Pacific, was Glenn Defense Marine Asia (GDMA), at the time the pre-eminent ship husbanding firm in the region. In fact, GDMA had pushed US Navy planners to send the Stennis to Kota Kinabalu, where the company controlled most of the port services and stood to make a significant profit. And they had a friend on the staff of Seventh Fleet, Cmdr. Mike Misiewicz, deputy of fleet operations. Misiewicz, in exchange for money and favors, fed GDMA information on upcoming ship visits and in turn, had a voice in where those visits would take place. GDMA and its chief executive Leonard Glenn Francis — widely known as "Fat Leonard" — are at the center of what is likely the longest-running scandal ever to hit the US Navy. The company, banned in September 2013 from doing any further business with the US, routinely overcharged the Navy by a total of more than $20 million, according to US Justice Department estimates.